DETAILS: 1340 Western Lake is a newly renovated and professionally decorated 4 bedroom, 4 bathroom home located in the Camp District of Watercolor. Shaded by towering pines, this cozy home provides a lush and private getaway for its guests. Upon entering the home, warm tones and comfortable furnishings are there to greet you after a long day of travel. Enjoy the screened-in porch that opens up to a nature preserve. The home totals over 1,200 square feet of covered outdoor space, so if spending time outdoors is what you seek, this is the ideal vacation home for you! The first floor bedroom has a king bed, private bath and access to the front porch that faces Western Lake Drive. The second floor has three additional bedrooms, one of those being the master bedroom with a king bed and private bath. The second bedroom on this floor has a king bed with it's own private bathroom and stand up shower. The third bedroom has two sets of bunk beds accommodating 4 guests with a private bathroom with tub/shower combination. Each bedroom comes with a flat screen television, giving you all of the comforts you would expect! 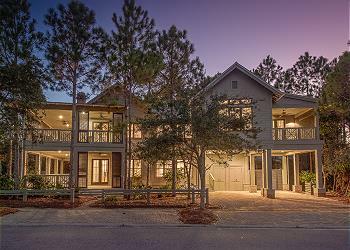 This house comes with 4 adult bikes and a 6 seater golf cart to cruise through Watercolor’s many boutiques and dining options. Check availability and book with 360 Blue today! We absolutely loved the house at 1340 Western Lake Drive. It is beautiful and so conveniently located to everything. The golf cart was a big plus for us as well. We were in town for a wedding. It is such a beautiful place, we are planning to go back soon. We are so delighted that you enjoyed your vacation with us in Watercolor! 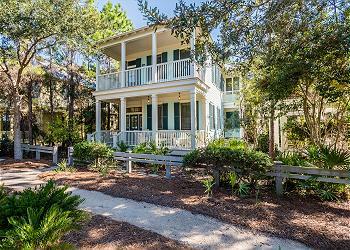 We agree that this home is perfect for a stress-free vacation and the location plus the golf cart makes it even more relaxing! We are looking forward to seeing you again soon! We really enjoyed Watercolor! The house was so nice and clean and so much room for our family. Will definitely be back! We are so delighted that you enjoyed your vacation with us in Watercolor! The photo you shared is priceless! We look forward to seeing you all again very soon! We had a wonderful week at watercolor. 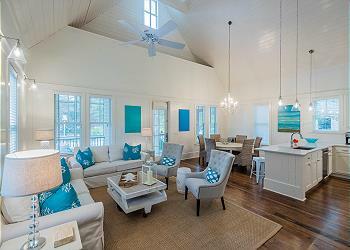 The beach house was very clean and spacious. We had plenty of room for 3 families and kids. We loved having the golf cart and bikes to get to the beach, pools and grocery. We highly recommend to stay here at 1340 Western Lake Drive. We are beyond thrilled to hear that you enjoyed your stay in this beautiful home. We loved having you with us and hope to see you back soon! Fun and fabulous vacation in Watercolor! The house was perfect for our group and met all our expectations. The kitchen was well stocked for our needs. We enjoyed riding bikes daily or using the golf cart for trips to the pools and beach. What a cute group photo! We are so pleased that you enjoyed your stay with us and you could take advantage of using the bikes and golf carts provided with the home! They really make trips to the beach so easy! Thank you so much for choosing 360 Blue and taking a moment to share your experience with us. Be sure to come visit again soon!